This cake is lemony and moist, just delicious. Great if you're having a friend over for a cuppa and a chat. In a bowl, mix the butter, sugar, lemon zest and poppy seeds and beat until the ingredients are well incorporated. Slowly add the milk (don't worry if the mixture looks slightly split). In another bowl combine the flour, baking powder and salt. Add the dry ingredients to the butter mixture in 3 additions, make sure you scrape the sides of the bowl after each addition to make sure everything is incorporated and the mixture is light and fluffy. In a separate bowl, whisk the egg white until stiff peaks form. Fold the egg whites into the mixture with a metal spoon. Pour into a greased ring mould and use a palette knife to even out the batter. Bake in the oven for about 30 minutes or until the sponge bounces back when touched. While the cake is in the oven make your lemon syrup. In a small saucepan, add the lemon juice, zest, sugar and 100ml of cold water and bring to the boil on a low heat. When the syrup starts to boil, raise the heat and boil until the mixture has reduced by half or until it has a thin syrup consistency. When the cake comes out of the oven and is still in the tin, pour the syrup over the top of the cake. Leave the cake to cool slightly before turning it out onto a cooling rack to cool completely. When your cake has cooled entirely, make your lemon glaze by mixing the icing sugar and lemon juice in a bowl. The juice from the lemon should be enough liquid to make the glaze, it should be thick, but pourable. If the glaze is too thick add more lemon juice or water to get it to an acceptable consistency. 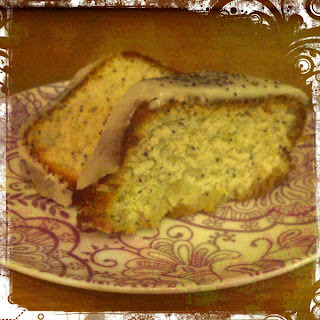 Place your cake on a stand or plate then pour the glaze over your cake and sprinkle the extra poppy seeds to decorate. I was able to find poppy seeds on eBay for a decent price. They have lasted ages, so it was definitely money well spent.